Once again the combination of moves from a blind looks truly amazing. Apparently, several hooked-in moves are outshined by their unhooked counterpart, which is great shame as they still showcase a lot of techniques and can still look so neat. It is indeed a medley of Hooked in a flare. By Popping High, you should patiently wait to travel forward before performing the “Throw” and “Blind” at the decisive moment. We will begin with the front to blind as for many reasons; it will be the simplest step for surfers to get your head around because it has definite flow in the move. You will need a fine popped front look and solid blind to get this one nailed. To build up to this technique, it is advised that you practice a bunch of high pops to blind. This will surely help your blind timing and your patience. The focus behind this is that when you do pop to blind, they consciously keep you at a low posture so that the landing will be well positioned. This will not be the case following a front loop. By popping high, you will have to stay still to travel forward before you “throw” and blind at the decisive moment just before your board reaches the water surface. Also it will show you to break your blind rotation from your pop which implies that you can add up into your popped front roll. At start, you have to bear away, heading off the wind for any pop technique. Park your kite at 11 o’clock and push your front foot away from you to facilitate the kite to fall back in the window for a bit and to allow your body a decent position to pop. With front leg stretched, hips over rear foot, shoulders back and upwind and head straight forward plus hands at the center of the bar, get ready to execute a clean trick. Popping into the front loop properly will make landing effortless. Carve harder upwind and keep the bar in to put tension on the lines, resulting the kite to pull you through the move, and as you launch, you purposely pull your front hand a little to stall the kite going up. It is important that the kite drags you through the move. Any kitesurfer is aware of that position to have something to pull against when about to throw to blind. If you hang under a high kite with loose back lines you may be able to land blind but will not ride away blind, indeed makes a lot of difference. Lead the spin with your head. As your head turns around, you can estimate where you are about to land. If you think it is much of a height, pull your front hand to fix this. Also, consider that the timing of when to throw the blind depends on your elevation. Maintaining your knees up watching where you are going can actually submit in a virtual slow-mo until you decide to throw the blind. Focus on this segment because this is the only most important part of performing a front blind. A front to blind is not one and a half front loops, it should break the spin from your front loop around to blind. There are two parts of movements: – you appear around the front and concentrate on where you’ll land, then turn your lower body around to blind as you keep on doing it with your high loop blind. Granted that you have already performed a blind, now pull your right leg behind you and shift your left leg beneath which will result to landing new tail first. This will allow the board to turn all the way for a smooth landing and likewise preventing you in burying the new nose in. After a blind, you should release your rear hand for two reasons. First, it helps you turn the full total to blind. Secondly, it releases the tension in the rear lines. The kite does not drag you so you should gain stability before reaching for the bar again. You could be pulled out of the blind if you landed with both hands on the bar. When you have smoothly landed and assessed your weight onto your new rear foot, reach for the bar with your rear hand. This way, you maintain your speed and can prepare you for a move from blind. Discovering anything to blind is a whole lot easier if the water surface is flat, as your board maintains its speed and you can manageably run on an edge. For the first attempt, try not to get too much elevation, if you have the kite positioned at 11 or 1 o’clock, you can pop hard but with less speed which will provide you enough time and move more accurately. 1. With your kite parked at 11 o’clock, pop up hard with your front hand connected to hold the kite from going up. 2. 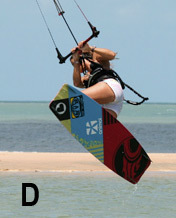 As you start to spin, secure the bar in and maintains the front hand connected to hold the kite from going up. 3. To make the rotation nice and smooth, raise up your knees. 4. While the bar is still pulled in, look over your back shoulder so that you can locate your possible landing spot as early as possible and can continue the rotation. 5. Considering that you still have time to have a bit of elevation, bar in and keep the knees up. 6. Coming down, you can performs the throw to blind and shifts the board through and underneath by pulling your front knee forward. 7. As your front leg comes through, whip your back leg around and still pull the bar in with arms bent to keep you well secure to the bar. 8. As you touch down let go off your rear hand to stabilize yourself towards a landing. With the bar pulling away, the kite will automatically drag you over. 9. As the board hits and you feel like moving wobbly, reach back up to the bar to control the kite. We’ve tackled it earlier but attempting to spin to blind just won’t work. You need to get the front loop organized and then whip yourself around. If you feel that you are over doing the spin, try slowing front loop down and then expedite your throw to blind. Doing the opposite is no good. If you are landing with just minimum speed, chances are, you came into the move too slowly and with the kite way high. Try to hit the gas a bit more and don’t let the kite hurl up more. Focus on maintaining the bar in, this way, you will gain more control of the kite and will get dragged with it providing you the perfect drive upon landing. If you fall backwards upon landing, you are releasing your hand too early which allows the kite to hurl away from you and also allows your legs and board to drop. Maintaining both hands secured helps keep the knees up and thus providing you stability. This entry was posted on February 26, 2012. It was filed under Intermediate and was tagged with Hooked in Front to Blind.